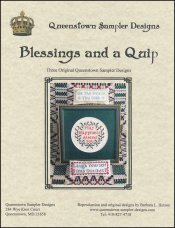 Blessings and a Quip [C6487] - $12.00 : Yarn Tree, Your wholesale source for cross stitch supplies. Cross stitch chart from Queenstown Sampler Designs. Three humble original designs. These can be framed, made into pincushions, ornaments, or bookmarks for a charming gift. Stitch counts: Be The Peace You Seek 31h x 73w, Laugh Yourself Into Stitches 31h x 85, and May Happiness Attend You 64 stitches each direction or a 4 inch round.